Place these fridge magnets on your kitchen fridge or on your filing cabinets. Great visible message of inclusion. 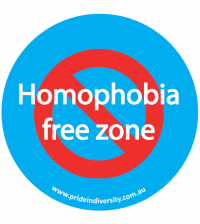 The Homophobia Free Zone Magnets are 8cm in diameter.